Posted on Tue, Apr 3, 2012 : 2:44 p.m.
Ann Arbor police are searching for an armed man who robbed the Subway on Eisenhower Parkway on Tuesday afternoon. 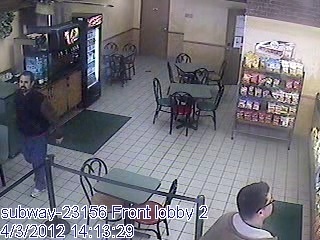 Ann Arbor police released this photo of the man suspected of robbing the Subway location on Eisenhower Parkway Tuesday. The suspect is the man in the dark jacket. Lt. Angella Abrams said the man robbed the store at about 2:20 p.m. Tuesday and then left the area on foot. The store is located at 885 Eisenhower Parkway in the Colonnade Shopping Center. Detective Bill Stanford said the man entered the store and hung out for a while, telling employees that he was waiting for a friend. When the store had no customers in it, a worker came out to the main area of the store to clean the floor, Sanford said. The man then followed the worker through the employee entrance behind the counter and produced a hand gun, Stanford said. He demanded cash from the employee, who complied, and the man left with an unknown amount of money, Stanford said. The man is described as black, about 5-feet-11 inches tall, average build, with a goatee, Abrams said. He was wearing a blue coat with brown sleeves with blue jeans and white tennis shoes, Stanford said. He was in his late 20s to early 30s and was slightly balding, Stanford said. Police are in the process of pulling images of the man off of surveillance cameras inside the store, Stanford said. Anyone with information on the robbery is encouraged to call Stanford at 734-794-6930 or Crime Stoppers at 1-800-SPEAK UP. Note: Detective Stanford's name has been corrected. Wed, Apr 4, 2012 : 12:26 a.m.
Looks like Mack from its always sunny in Philadelphia. Tue, Apr 3, 2012 : 11:20 p.m.
Policy? Get real. If you were there and got shot in the foot, how would you descibe the FACTS. Tue, Apr 3, 2012 : 10:25 p.m.
Wonder if he escaped on the bus. Tue, Apr 3, 2012 : 11:24 p.m. It certainly wasn't the subay. Anyhow.. With that high quality of a photograph taken it is certain that this guy will be caught in due time. Tue, Apr 3, 2012 : 8:24 p.m.
Tue, Apr 3, 2012 : 8:04 p.m. I thought it was decided not to give details like race in a suspect's description? I seem to remember a brouhaha like that a year ago....has policy changed? Wed, Apr 4, 2012 : 1:09 p.m. It's pretty clear from the video on the security cam shown at the top of this article that the guy is black...are you saying that the reader is not entitled to know what race the perp is? It is refreshing to see that even the MSM is now occasionally tagging perps by color, probably because when they show images of the perp is is obvious to the reader/viewer..
Tue, Apr 3, 2012 : 10:02 p.m.
djacks- That's a much more succinct way of saying what I was trying to say. Thanks. &quot;Anyone with information on the robbery is encouraged to call Stanford at 734-794-6930 or Crime Stoppers at 1-800-SPEAK UP.&quot; Looks like they want tips and knowing what race the person is helps get them tips. Not a race thing. It just is what it is when mentioning what race the person is believed to be. The general way I go about this is based off of how much detail I have about a person's description. For instance, if all the police can release is &quot;a black man wearing a t-shirt&quot; or something, then I don't include race - that's too general of a description and having the race involved doesn't help anyone identify the suspect. However, in instances like this where there is a clothing description, height description, body type description, facial hair, etc., then I include race because I believe it's helpful to give a full description of the potential suspect. It's something we discuss here before printing, but I am not aware of any policies here that dictate specific instances when race can or can't be used. These are general guidelines I use for my own reporting that my bosses seem to generally agree with. Tue, Apr 3, 2012 : 7:22 p.m.
You guys get razzed so much I just want you to know, my Husband works in this area and he called me to see if there had been another bank robbery. Thanks to AnnArbor.com I was able to tell him it was Subway AND give a description of whom they are looking for. Might be wise to set up a Nixle alert in that area for all the business, including apartment complexes, as they can be the eyes and ears of the community effected by this kind of chaos.